Integrations for Dynamics GP to other systems can be done with pre-configured tools, or our team can build the integration if one does not exist. These eConnect interfaces allow external applications like web storefronts, point-of-sale systems, time-clocks, Epic software healthcare applications, or legacy applications to integrate with Dynamics GP. The external applications can perform actions like creating, updating, retrieving, and deleting records and transactions in GP. Although eConnect supplies a large number of documents, not every Dynamics GP feature is available through eConnect so other tools may be necessary. Through the web service, integrated applications can retrieve documents, create new documents, update existing documents, and delete or void documents. 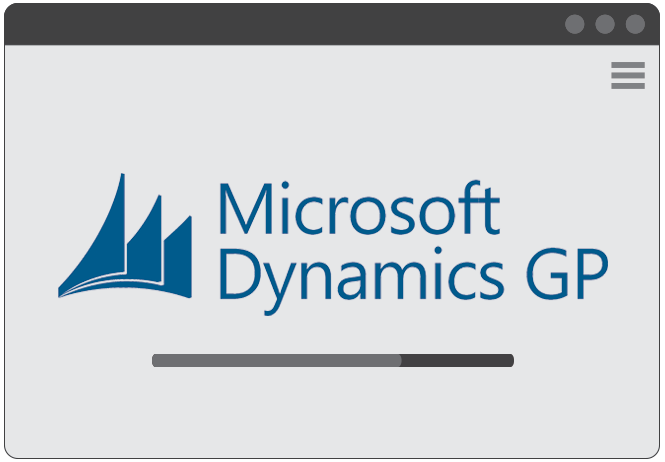 The web service for Dynamics GP is fully integrated with the Dynamics Security Service. The administrator of the web service can configure security so only specified users are allowed to perform actions like creating or updating sales documents. Using a Graphical User Interface, the Integration Manager for Dynamics GP is a user-friendly tool designed to move data quickly and easily from an outside data source into GP. The benefit of using the Integration Manager is that additional programming or extensive knowledge of the underlying databases is normally not required. It allows users to create an integration by specifying sources such as text files or ODBC databases and setting up the mapping to the destination file in GP, such as the Customer card, Payroll Employee record, or a transaction record. Examples of integrations using Integration Manager are the transferring of hours worked by each employee from the time-clock system to GP, the passing of patient billing information from Epic patient engagement software used by hospitals and clinics to GP and the import of sales information into GP from MICROS point of sale. Integration Manager can be scheduled to run daily, weekly, monthly, or whenever it is necessary for data to be moved from the source to Dynamics GP. Sometimes the only way to accomplish the desired movement of data is by writing SQL jobs to push and pull data within or between Dynamics GP, KEY2ACT, Binary Stream and other ISV solutions. Our SQL programmers are experts in doing this for our clients and are available to assist you. Contact Implementation Specialists today to learn how we can bring it all together to provide your business a complete solution that will meet your immediate and future needs as you continue to grow.